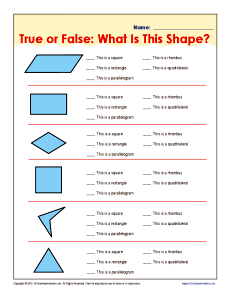 True or False: What Is This Shape? A square is a square, but it's also a rectangle, a parallelogram and a quadrilateral. Your youngster can work with the hierarchy of shapes in this math worksheet. It's great to use with Common Core Standards for Geometry for 5th grade. You may also find it helpful for other grades.